Knox News: After being freed from the Italian prison where she has spent the past four years, Amanda Knox was back in the United States today, ready to start her life again. The 24-year-old will be staying at her parents till she finds somewhere else to stay, and with that in mind has already placed a Gumtree advert online. 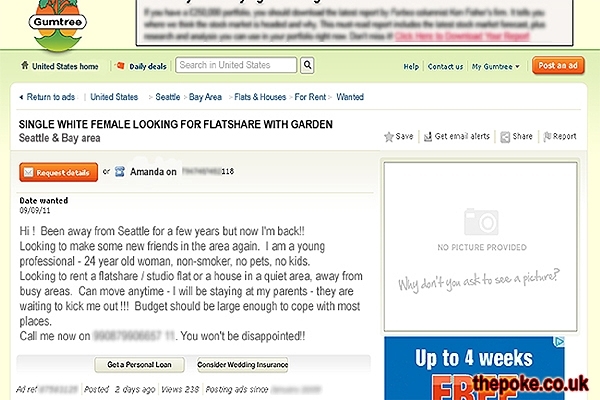 The ad, which is headlined as ‘SINGLE WHITE FEMALE LOOKING FOR FLATSHARE WITH GARDEN,’ breezily reveals that she is happy to be back in her home town and that she has a ‘large enough’ budget to pay for most areas. However, despite already gaining a few hundred views, Ms Knox hasn’t received any firm offers for a flatshare so far, and although loyal friends and relatives gave her a warm welcome home, most remained tight-lipped when it came to offering her a place to stay.